It would be wrong to think of the nations of modern Zenáthras the same way one thinks of countries as they used to be. In the past, a country's borders were long, snaking things that showed the lands within which their rulers exercised control, guaranteeing their citizens' safety, farming and hunting and trading with relative security. But today, a 'country' is better defined as a collection of towns and cities and their immediate surroundings, bridged by untamed wilderness. Even mighty nations such as the Council of Wyrms or the Tyrancy of Geddephron must send heavily-guarded caravans if they wish to travel between even the nearest cities within their 'country,' often controlling less than 5% of the land within their nominal borders. Though they can secure enough countryside to farm with the help of patron magic and feed their relatively dense populations, this danger also limits how big cities can grow. The largest city in Zenáthras—Clockwork Garden—is considered a miracle for housing nearly 80,000 people; nearly twice the size of the next-largest settlements such as Liracrast and the City of Rivers. 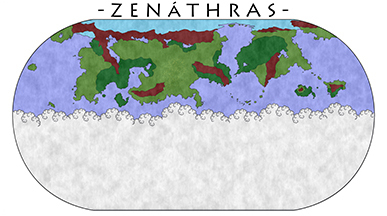 Though stories of the times before would speak of independent city-states with populations into the millions, it is unlikely that such marvels will be seen again in Zenáthras. Now, it is far more common to have isolated villages of only several hundred worshipping the Great Beast that keeps them safe and provides their leaders with small amounts of magic. There are uncounted hundreds or even thousands of these dotted across the map, unwilling to join one of the greater nations or perhaps even unaware of the existence of civilization outside their borders. 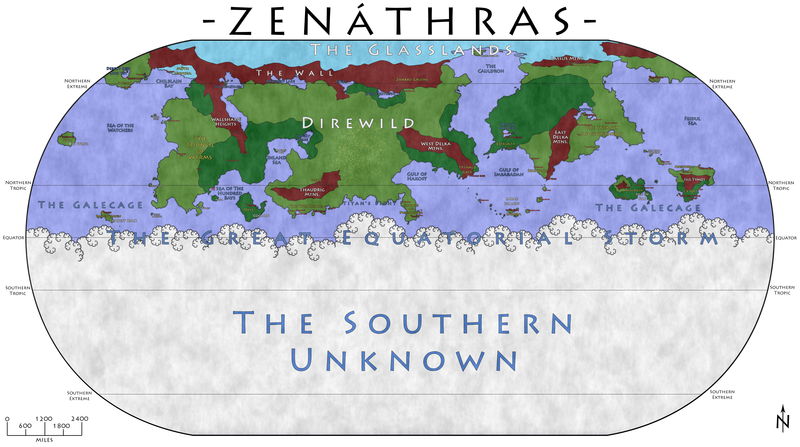 Detailed below are the most powerful nations in Zenáthras: actors on the world stage with the capability of projecting force beyond their meager borders, even if much of the land they claim is still untamed wilderness and deadly with the monsters that truly rule the world in this age.